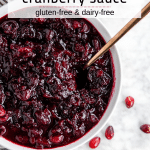 Red Wine Cranberry Sauce - Gluten-Free, Dairy-Free, Only 6 Ingredients! 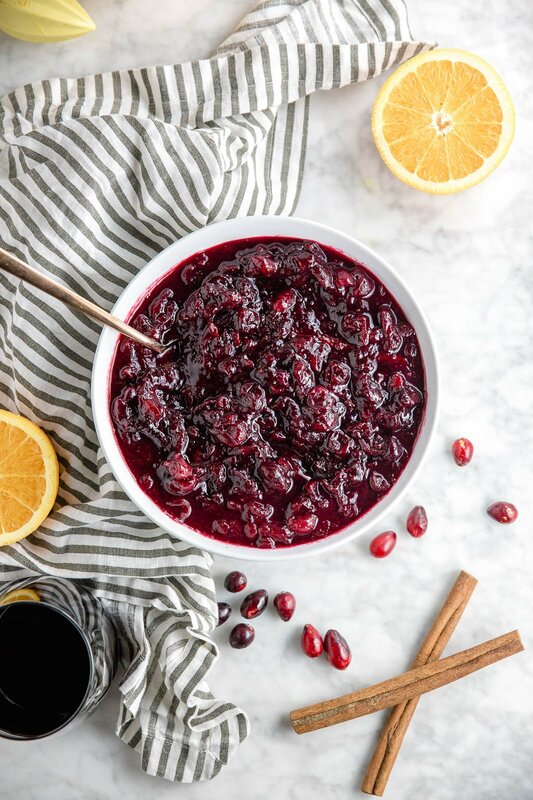 Red wine cranberry sauce is such a fun twist to a traditional cranberry sauce for Thanksgiving. It’s so easy to make with just a few ingredients. The red wine brings such a depth of flavor and compliments the cranberries so well. Do you love cranberry sauce as much as I do? Growing up, cranberry sauce definitely wasn’t my favorite dish on the Thanksgiving table. We always had the canned kind that you had to slice and jiggled when you went to take a bite. Unsurprisingly, there would be leftovers. Nowadays, I cannot get enough of homemade cranberry sauce. Admittedly, I also kind of like the canned stuff now. It’s like a cranberry gelatin dessert and I just can’t help myself. What can I say? Now that I know how to make my own homemade cranberry sauce, it’s become a holiday favorite of mine. I love the tartness of the cranberries with a touch of sweetness. Some people like their cranberry sauce to be overly sweet, but not me. I prefer my cheeks to pucker a little bit with each bite of cranberry sauce. 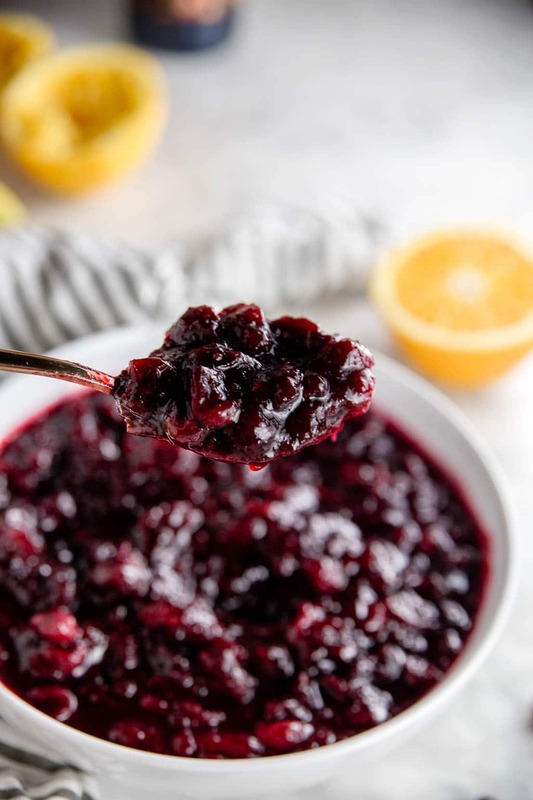 If you’re looking for a fun variation on your traditional cranberry sauce, then this red wine cranberry sauce is for you! Instead of water, we’re using red wine to cook these cranberries. The result is a cranberry sauce that has a deeper flavor than the traditional. I got the idea to make this red wine cranberry sauce when I was drinking a glass of wine and working on my Thanksgiving menu. Go figure. As I wrote down the words “cranberry sauce” I was trying to think of a fun variation that may be different than I’ve done in years past. One sip of my glass of red wine and I knew I had to mix the two together. It was a no brainer! Red wine, fresh cranberries, orange juice and zest, sugar, and cinnamon sticks combine to create this sophisticated take on cranberry sauce. Every bite reminds me a mulled wine which is just perfect for the holidays! Which Red Wine is Best for Cranberry Sauce? Definitely use a red wine that you would normally like to drink. You don’t want to use the cheapo stuff that has a pungent taste (you know what I’m talking about) for this cranberry sauce. Since it’s a quick cook time, you are infusing the cranberries with the flavor of the red wine. So let’s leave the two buck chuck for the college kids and get something you actually would drink yourself. I’m not saying you need to buy the nicest, most expensive bottle of wine. Mine was only about $15 at Costco! As for types of wine, I find a dry red wine tends to work best. I used a cabernet sauvignon, but I think red zinfandel, pinot noir or even a dry port would work well here. But, experiment. Add what you like to drink. Go with it, friends. I like to add the zest and juice of an orange to this red wine cranberry sauce to brighten it up a bit. Traditional cranberry sauces tend to contain orange juice, so I wanted to keep this cranberry sauce slightly familiar. Plus orange and cranberries are just a match made in heaven. Fresh cranberries are abundant this time of year. They typically come in a bad in the produce department near the berries. Once you open the bag, pick through the cranberries and only use the ones that are firm. Discard any cranberries that are mushy or brown before adding to the pot. Cranberries are a berry (obviously). But they are much lower in sugar than their berry friends, like blueberries and raspberries. That means, you NEED to add sugar to cranberry sauce. Like I mentioned, I like my cranberry sauce to be on the tarter side. I’ve added 3/4 cup of brown sugar to this recipe, but you could probably go up to a cup or even a little more if you like your sauce sweet. Brown sugar is my sugar of choice for this recipe, but granulated sugar works as well. Brown sugar has a beautiful molasses-like flavor, which is why I like it for this red wine cranberry sauce. This is a bit of a go big or go home kind of cranberry sauce. Need More Gluten-Free Thanksgiving Recipes? Try These! 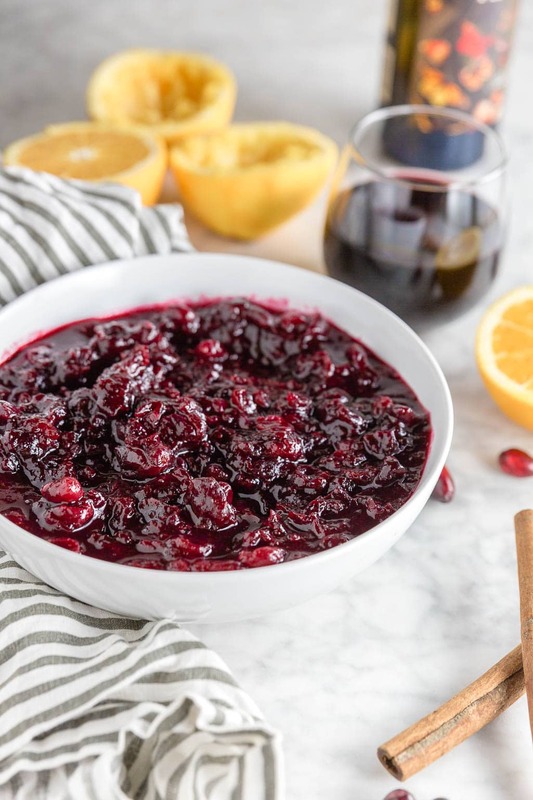 A unique take on a traditional cranberry sauce, this red wine cranberry sauce is full of flavor. 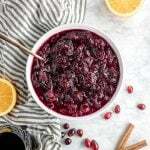 Red wine, fresh cranberries, orange, brown sugar, and cinnamon sticks are all you need to create this easy gluten-free side dish for the holidays. 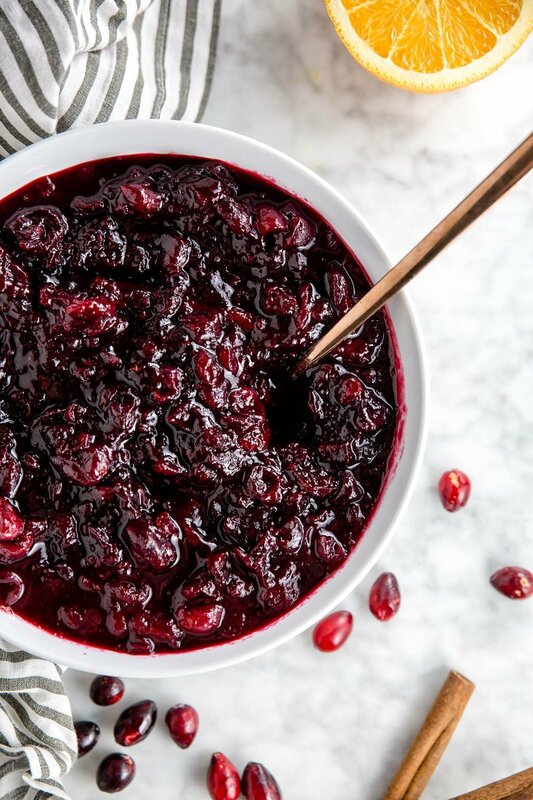 Red wine cranberry sauce is such a fun twist to a traditional cranberry sauce for Thanksgiving. It's so easy to make with just a few ingredients. The red wine brings such a depth of flavor and compliments the cranberries so well. In a medium saucepan over medium heat, combine dry red wine, orange juice and brown sugar. Bring to a boil. Heat and stir until brown sugar dissolves, about 3-4 minutes. Add cranberries, orange juice and cinnamon sticks. Bring back to a boil. Let simmer for 10-15 minutes, until cranberries have bursted and sauce is thick. Be sure to stir occasionally so sauce does not bubble up and overflow.